Black Widow #9 Review – AiPT! It’s snowy, cold, and some justice is in order with Black Widow this week, which is fitting having just come off Christmas! We delve into issue #9 and answer the question, is it good? So what’s it about? Read our preview to find out more! The last two issues were fantastic and then you add in Winter Soldier’s obvious involvement (he’s on the cover after all) and we have a powder keg about to go off. Well when you yell like that I doubt they will! This issue brings the hard hitting action with some fantastically rendered choreography from Chris Samnee that’s intense and easy to follow. Using silhouettes of the fighters, you get a sense of their exact movements as the dark contrast helps focus your attention there. The backgrounds, cast in bright colors by Matthew Wilson, makes them pop even more. The colors throughout in fact are very nice, with cool blues and whites to convey the harsh cold. There’s also a nice use of sound effects, with a metal spike from Natasha’s wrist sp-Dinking through the D in “Dink” (also is that the statue from Maltese Falcon?). 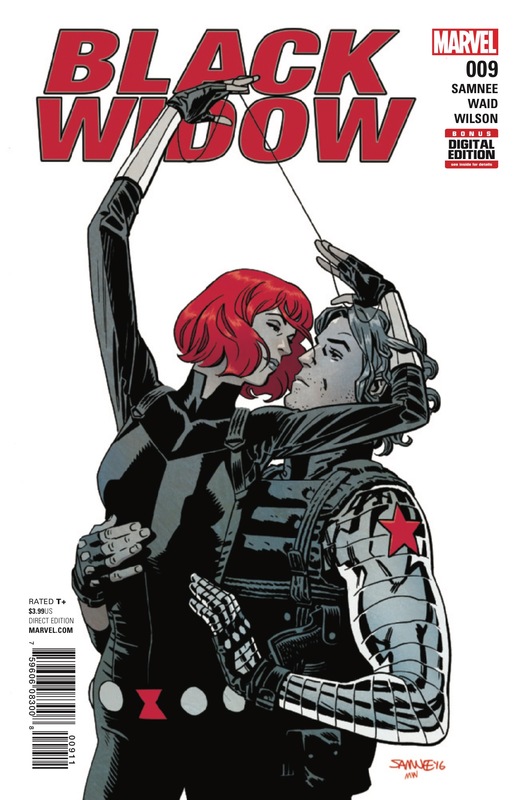 Mark Waid weaves in some undertones of Black Widow and Winter Soldier’s past that helps add a layer of drama. He does this with some bits of dialogue here and there which seems to go against the presumed relationship they might have. This adds up to a cliffhanger that seems to suggest they both have no reason to trust one another. Not to worry if you’re wondering if the plot goes on hold here either, as there’s a nice check-in outside of Black Widow’s story. And while this scene is more of a check-in, it does give the issue more value when so often comics will drop an all action issue that’s fun, but doesn’t add much. Like the last paragraph says, this issue is mostly action. It certainly makes the page turning go faster and ultimately make this a fun but quick read. A visual feast for action aficionados. Don’t miss this if you like your action in the style of Jason Bourne.